JoAnne Duby began her art career as a ceramist over 25 years ago by studying at the Seaward Ceramic School in her hometown of Seattle, Washington. Growing up in Seattle fostered her appreciation for the natural environment and she has always sought to bring this attachment to her artwork. 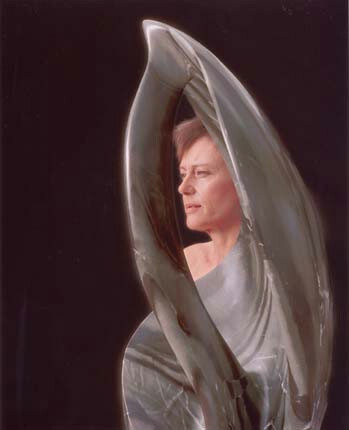 While teaching ceramics at Santa Barbara City College, JoAnne discovered a love for sculpting. In addition to her own work, she assisted Donald Davis, an Italian marble sculptor of world renown, on numerous projects from 1977-1984. From 1978-1988, she also worked with sculptor Todd Andrews enlarging small models to monumental size in T.A.S.C.O., a company they started in 1980. They worked in every sculpting medium and with artists from all over the world including Arnoldo Pomodoro, Richard McDonald, and Malcolm Alexander. In 1988, Paul Lindhard invited JoAnne to rent a studio at Art City in Ventura where she could concentrate on her own carving in addition to the occasional commission for monumental works and bronze castings. Since joining the Art City collective of artists, the artist has shown her work on a continuing basis at Art City. She also participates in international shows and her work is held in collections in Europe and the Americas. Joanne Duby’s documentation took place in 2001. The FOTM Archive contains extensive information about this artist.